Support for Leg and Foot - The Freestanding Double Leg Rest is intended to act as an assistive therapeutic device. Leg rests are typically employed temporarily by those returning to work after injury or surgery. However, in the case of those with circulatory problems they may also become a permanent solution. 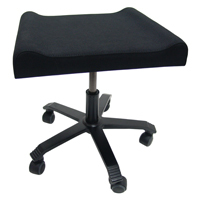 The leg rest pad can be tilted to align the leg(s) to an ideal ergonomic angle. Some conditions which may benefit from the Freestanding Leg Rest include Knee Injuries, Bunion Removals, Back Pain, Varicose Veins, Edema, Heavy Leg Syndrome, Neuromuscular Disorders, Trauma, Pregnancy, Cardiovascular Disease, Diabetes, Side Effects of Certain Medications. Increases Blood Flow and Circulation - The Freestanding Double Leg Rest can assist in maintaining appropriate blood flow and circulation in the lower extremities. However, using the leg rest for extended periods may lead to decreased blood flow and circulation as a result of the non-standard seating position that the elevation of the leg can create. Unless directed otherwise by medical service providers it may be a good idea to occasionally remove the leg from the pad and adopt a more traditional sitting position, even if for short periods. Enhances Productivity and Overall Comfort - Working in a semi-reclined position or with the feet elevated as required throughout the workday can adjust the strain on other muscles in the body and decrease fatigue. This can yield increased comfort by offering varied seating postures and potentially reduce the impact of discomfort on work performance. Height Adjustable: The leg rest pad can be adjusted in height from 17.7" to 22.8" when level. This range is suited to the majority of persons but shorter users who do not already use a footrest may need to elevate their chair and add a foot rest for the other foot (see Usage Tips below). Adjustable Tilt: The tilt of the leg rest pad locks at any position between 0° and 15°. This lets users select the angle that best suits their needs and ensures that the leg(s) remains at the desired angle. Cushioned Support: Foam padding provide comfortable but firm support which quickly springs back to shape. Choice of Cover Material: The furniture fabric covering of the pad 'breathes' better than the leatherette covering. This aids in preventing hotspots and sweating. However, the leatherette-covered pads are more easily cleaned and disinfected. Versatile and Portable Design: The Freestanding Single Foot Rest is equipped to be self-supporting and move independent of any other furniture. As a result users are able to make small positioning adjustments with nominal effort, changing positions to optimize comfort throughout the day. Safety Lock Casters: The Freestanding Single Leg Rest is equipped with casters that engage a safety lock when weight is removed (i.e. when the weight of the leg(s) is no longer applied to the rest). This ensures that the Leg Rest cannot roll out of reach, which is especially important for those who would have difficulty retrieving it. NOTE: The legrest locks in position at any point within the 15 degree tilt range. Caution: The gas cylinder which provides the height adjustment exerts significant upward force when the release lever is activated. For that reason height adjustments are best performed with a counter-active force pressing down on the leg rest when the lever is released. Note that the weight of the legs resting on the surface is insufficient to provide the necessary countering force. Users needing to lower the leg rest will be unable to exert sufficient downward force from a seated position. The easiest way is to use the knee to push down while the lever is released which is why some users may require assistance. Small upward adjustments can be accomplished by quick minimal activations of the height adjustment release lever. When making initial height and tilt adjustments it is suggested that you enlist the assistance of another person who can perform these adjustments while you are seated comfortably. This will ensure that the height and angle are adjusted to match your optimum seating position. Shorter users who do not already use a foot rest may find the minimum height of 17.7" (when flat) a bit high and may need to raise their seat to accommodate the height of the leg rest, especially if it is being used at an angle. Note: At the minimum height setting, when angled to the maximum tilt the leg rest elevates to 18.75" (47.6 cm) on the end closest to the user's chair. Unless directed otherwise by medical service providers it may be a good idea to occasionally remove the leg(s) from the pad and adopt a more traditional sitting position, even if for short periods.